As you may know, I am a man of sound. If you have any idea how computerized sound waves work, they are a horizontal digitized visual representation of any distinct sound, so distinct, that every peak represents the sound’s unique properties, expressed in the auditory range of about 20-20,000 Hz, known as the human auditory spectrum. Without them, we would have no digital editing, advanced FBI bugging, and no discrete proof for sample-clearance lawsuits. Ideally, any sound can have its own visual fingerprint using this science, so theoretically, every person’s voice can have its own unique audio wave pattern. 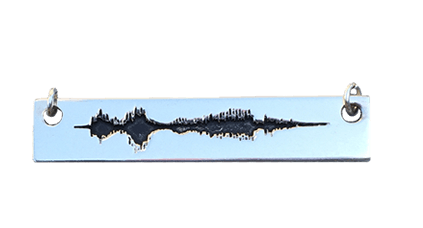 A company called Soundwave Art decided to take this technology and transform it into wearable jewelry for unbridled passion amongst audio whores. 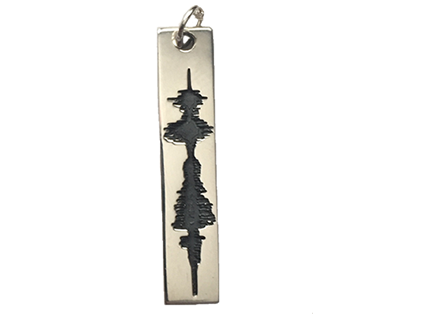 Their Soundwave Pendant ($150) [don’t expect gold!] will allow one to record their very own personal message directly on the company’s website and watch it transform into an audio sound wave pattern on the fly, and then the wave pattern can be made into a pendant with your choice of horizontal or vertical. If I was a bigtime rapper, I would be selling these out the back of my van !